All true Christians want to live lives that are pleasing to God. Sometimes, however, it can be difficult to know how to apply the Bible to situations that arise in everyday life. In this series, Dr. R.C. 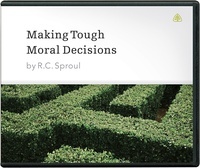 Sproul gives a brief examination of Christian ethics. After introducing the topic of ethics, he then proceeds to deal with three important ethical situations that we face in everyday life.